A seasoned 37-year-old champ, Floyd Mayweather Jr, will climb through the ropes at the MGM Grand Garden Arena in Las Vegas on Saturday night knowing that the last time his champ status was questioned to a point that warranted a rematch (Jose Luis Castillo), he provided clear answers and removed all doubt; that was in 2002. Since then Floyd’s put in some great performances over the years, perhaps not in the most exciting style but in his own, unique style which has kept him undefeated so far, despite not having stopped an opponent since 2011. Marcos Maidana’s 31 years’ old and is a hungry, aggressive, and exciting fighter with a point to prove in the world of boxing. His style seems to be borne of the school of blood and guts with a ‘let’s fight’ approach. He’s picked up a couple of losses along the way which is no surprise given how he operates in the ring, but he’s also picked up knowledge and experience which is making him better and better at fighting, and he’s already stopped 31 of his opponents and has never been stopped himself. 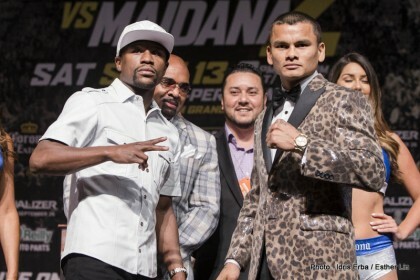 When Maidana first clashed with Mayweather it was business as usual for Maidana, with him coming on to his opponent, making the fight, throwing his typical, hard and often unorthodox shots, and generally crowding and pressuring his opponent. For Mayweather, it was an unusually tough day at the office – he seemed unable to escape the pressure and he was getting hit about, not cleanly, but enough for him to be a long way out of his usual ‘comfort zone’. Floyd had to work that night, a lot harder than he’s accustomed to. As the fight wore on Maidana’s ability to maintain the heat began to wear out, and with the pressure easing Floyd was able to find a little of the composure that he’d lost in the first half of the fight which allowed him to even things up a little. The judges saw fit to award Floyd a majority decision victory whilst the boxing fans saw fit to call for a rematch. Can the rematch be any different? Floyd says ‘my hand got raised, I don’t need to make any adjustments’, which is, rather naively, making the assumption that Maidana’s going to perform in exactly the same way as before. Maidana didn’t get the decision last time so I’m guessing he’s gone back to the drawing board, with his team, to figure out where he can make changes and improve upon his last outing, and seeing as Maidana’s an improving fighter it’s not too difficult to imagine a better performance from him. On the flip-side, Mayweather doesn’t see the need to make any adjustments, despite suffering an unusually difficult night against the rough, explosive and determined Argentinian. Perhaps in Mayweather’s preparations he’s sufficiently content with the prospect of reliving those glory days of when he last won a rematch, twelve years ago? Maybe he’s as confident as the bookies are on the outcome regardless of what ‘El Chino’ decides to bring to the ring on the night, and the bookies never get it wrong… do they? Previous boxing news: Lucian Bute joins the trainer of the year: Freddie Roach!